Berwick emerged from an almighty scrap with Officer to take the four points at Edwin Flack Reserve, 8.15 (63) to 2.6 (18). After two consecutive losses – which is foreign territory for the reigning premiers – some sort of response was certainly necessary for Stewart Kemperman’s side. The rain pelted down, and the Wickers were simply more physical at the contest, surging out to a 25-point quarter time lead, holding the Kangaroos goalless. On a day where clean hands where a must, Madi Andrews had a superb opening term, combining nicely with a dangerous Bailey Asher early in the contest. The Kangaroos were unable to hit the scoreboard in a meaningful way until the third term when the game was effectively over, with the Wickers’ incredible team defence finally being undone by a fifty metre penalty duly slotted by Harry Dean in the goal square. 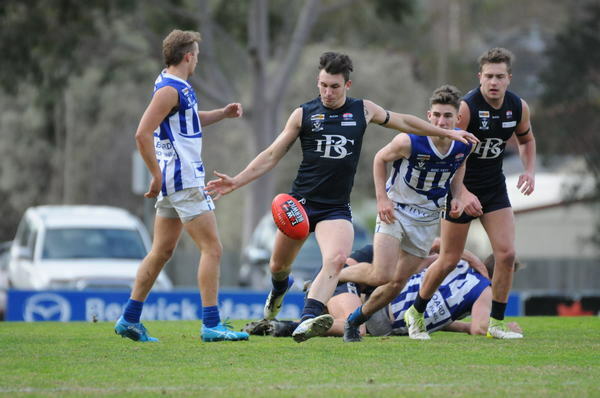 Doug Koop’s side showed a bit of steel to register another goal by three quarter time, but were held scoreless in the final term as the home side surged home to boot a further three majors. Finally back on the winners list, the Wickers were well served by Asher (two goals) and Brody Connelly (two), while Madi Andrews and Travis Tuck certainly relished the conditions at hand. “Earlier in the year, we played Narre Warren in similar conditions, we didn’t adjust quickly, and it was good to take some learnings from that into the weekend,” Wickers coach Stewart Kemperman said. Kemperman said it was important that his side could bounce back from two fadeout losses in recent weeks. “Winning habits are good habits, and it’s important to get back into that winning circle,” he said. 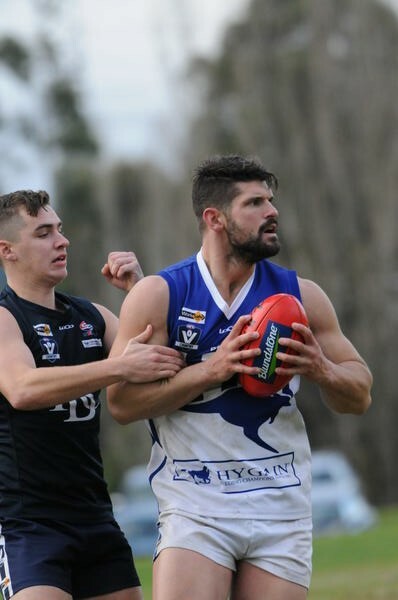 “The losses have been interesting, we’ve had strong efforts in both games – in the Cranbourne game, we had a bad lapse, and against Narre our effort was tremendous. Down at Kalora Park, the undefeated Narre Warren not only brushed aside the weather, but kicked another 23 goals, in a testament to their belief. Pakenham were nothing but gallant in their 23.15 (153) to 8.8 (56) loss, but were ultimately outclassed by a side at the top of their game. The Magpies have built their 2018 campaign on consistency, and also an ability to trap the ball inside 50 with repeat entries. It’s been the cornerstone of a flawless eight games. Ash Green’s side were defensively solid as they have all season in the first term, conceding just the three goals while piling on two themselves to be holding an eight-point deficit at quarter time. But a dominant second term saw the home side surge away to a 47-point lead, with Brad Scalzo, Michael Collins, Mitch Cox and Josh Tonna was all class as they kicked the ball forward into the hungry arms of Nick and Stew Scanlon, as well as Aaron Wilson, who warmed into the game with a towering presence. The Lions – to their credit – managed to stem the bleeding briefly with a terrific 30-minutes in the third term, winning the quarter and showcasing some impressive efforts in the contest. The Magpies’ overriding control over the contest continued on with a dominant final term, slamming through 10.5 to just 0.2, flexing their muscles when it mattered. Dominant up forward, the trio of Wilson (six goals), Nick Scanlon (five) and Stewart Scanlon (three) combined in what is a frightening trio for even the most seasoned defenders, while the usual suspects in Col McNamara, Jesse Davies and Jake Richardson were stingy in one of the best defensive units in the competition. On a day where the Lions showed glimpses of the future, Steve O’Bryan, James Harrison and Adam Alberni were consistent throughout the game. In the other match over the weekend, Tooradin-Dalmore were far too strong in a 7.9 (51) to 16.11 (107) win over Doveton at AJ Robinson Oval.